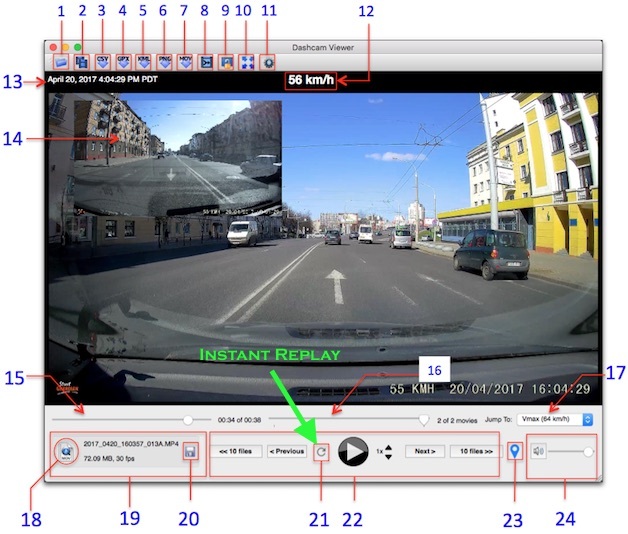 Dashcam Viewer v2.6.2 is now available from our website. This version adds a number of new features and optimizations as described below. Added user-configurable ‘instant replay’ button to quickly jump back in time. See image below. Added the option to prevent loading of GPS data. This allows you to load and play many movies quickly. 5x-10x faster loading of StreetGuardian SG9665GC and BlackBox B40 movies (thanks to Rick R. and Jon S. for their help). Dashcam Viewer v2.6.1 is now available from our website. This version adds a number of new features and bug fixes listed below. Users can now ignore (skip) the first few seconds of each movie to support dashcams whose consecutive movies overlap. The skip amount is set in the Preferences window. ToDo: apply the skip value to the “merge videos” feature. Improved accuracy of frame-by-frame mode for movies with non-30 fps frame rates (thanks, Dean, for pointing this out). Added ability to swap the front and rear movies in the main display by tapping the ‘r’ key. (thanks, Mick T., for the suggestion). ToDo: add toolbar button to initiate the swap. Fixed bug that would fail to load GPS data if a .txt file was in the movie directory.